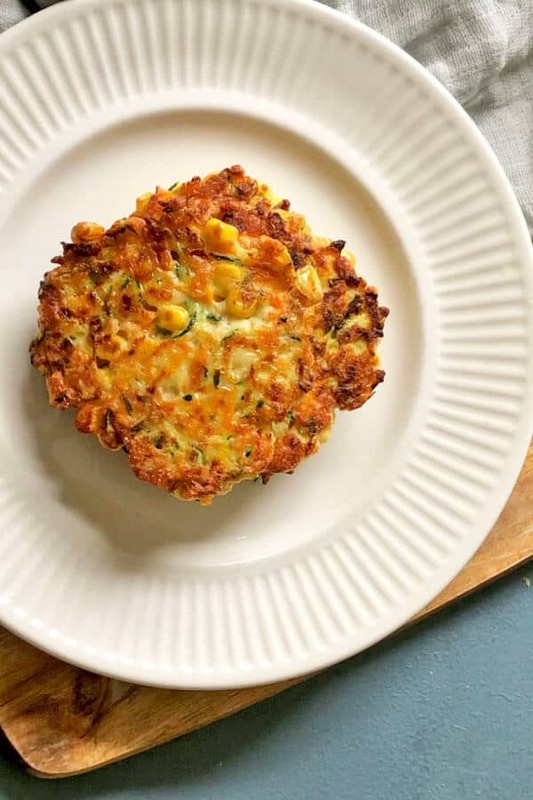 Quick and easy to make, these Zucchini and Haloumi Fritters with Sweet Corn are a great way to sneak some extra veggies into your diet. These cheesy golden fritters are a healthy and super tasty snack, lunch or dinner that the whole family will love. Boy do I have a treat for you guys today. 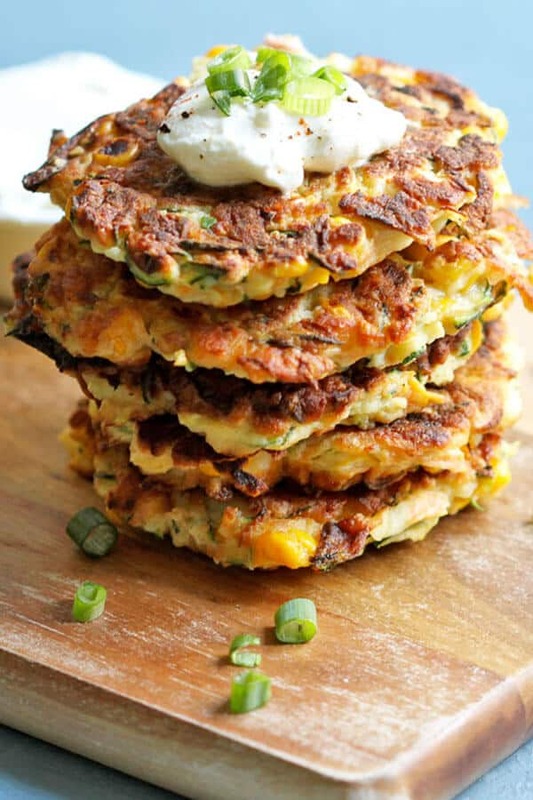 These Zucchini and Haloumi Fritters with Sweet Corn literally made my week this week. I’m a huge fan of fritters from way back. I especially love that they are a super easy and more importantly a tasty way to eat more vegetables. 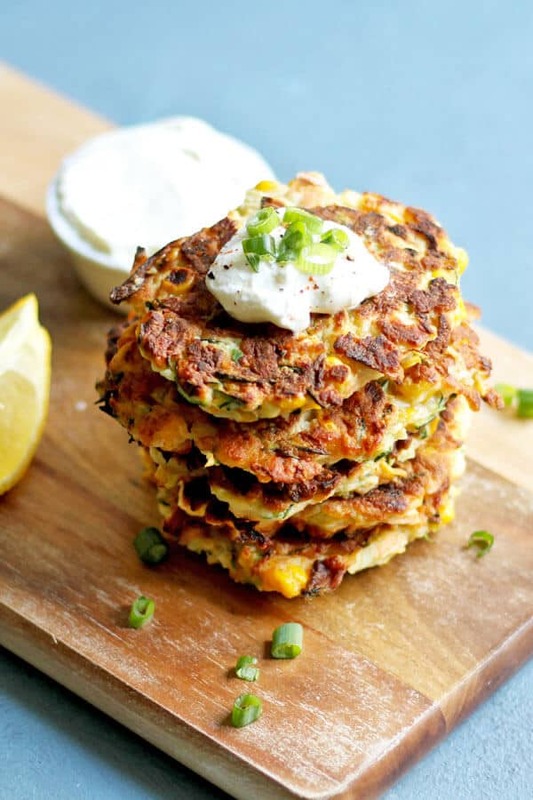 I generally whip up my Carrot and Zucchini Fritters to reheat as a quick breakfast option. They are very healthy and full of good for you ingredients. These Zucchini and Haloumi Fritters on the other hand – they are good for your soul. You know those foods that you eat and immediately start dancing on the spot because they are JUST THAT GOOD? Yep – that’s these fritters. The crisp corn kernels and melty fried cheese scream indulgence and you would never guess that they are filled to the brim with veggies. But don’t take my word for it. Try them for yourself. Corn Kernels – Can use fresh, frozen or canned kernels. All Purpose Flour – OR you can use wholemeal flour or almond flour if you’d prefer. Olive Oil – Or you can use another frying oil, like grapeseed oil, if you prefer. 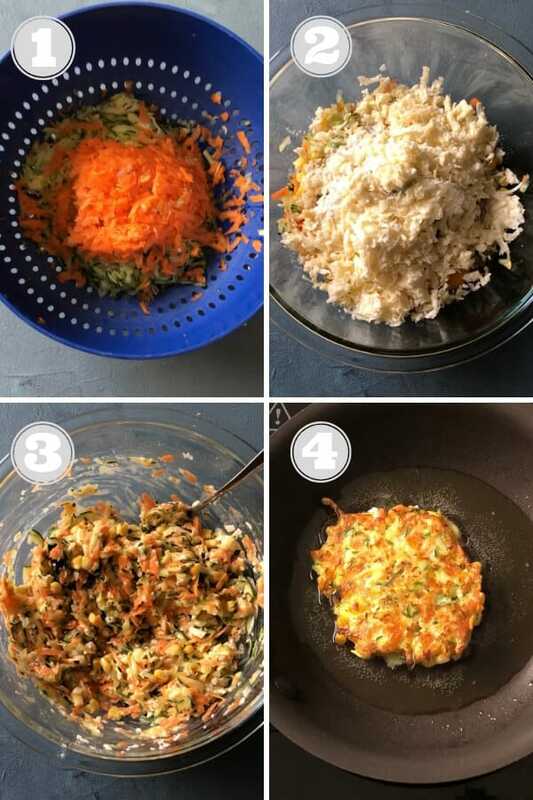 Grate the zucchini and carrot directly into a colander and leave rest for 10 minutes. Then squeeze out extra moisture either by wringing the mixture with your hands and placing in a clean bowl OR by putting into a clean tea towel and wringing it (photo 1). Mix all the fritter ingredients in a large mixing bowl until well combined. (photos 2-3). Heat oil in frying pan on medium heat. Place a tablespoon or so of the fritter mixture in the pan and flatten with the back of the spatula. Repeat with the remaining mixture, cooking in batches without overcrowding the pan (I usually fit 4 fritters each batch). Cook for 3-4 minutes each side until golden and crispy. Transfer to a plate lined with paper towel. (photo 4). Most fritters taste best when served straight after frying when they are at peak crispiness. You can still store leftovers and reheat later. Just be mindful that they may be a little soft. I regularly enjoy my leftovers over the next few days and thoroughly enjoy them regardless of if they are as crisp or not. Store fritters in an airtight container in the fridge for up to 3 days. Individually wrap fritters in cling wrap / plastic film, then pop in an airtight container or freezer bag and store for up to 1 month. Thaw overnight in the fridge when you’re ready to use and follow the reheat instructions below. Heat oven to 180C / 350F. Pop fritters on a baking tray lined with baking paper or a silicon mat, and place tray in the oven for 10 minutes, or until fritters are heated all the way through. You can reheat in the microwave, although, I find this method makes the fritters soft and soggy and I don’t recommend it. 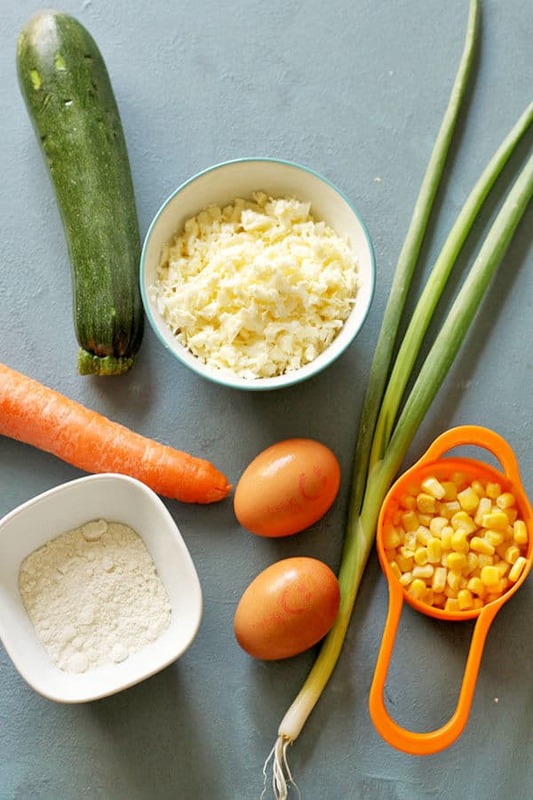 Make sure you squeeze the excess moisture out of your zucchini and carrot. Nobody likes soggy fritters. If you find the mixture too wet and not holding, add in teaspoons of a flour at a time until it’s just right. You need enough oil to just cover the bottom of your frying pan. Make sure it’s hot before popping the fritters in – AGAIN, Nobody likes soggy fritters. Cook the fritters in batches, about 3-4 at a time so you don’t overcrowd your pan. If you’ve tried these Zucchini and Haloumi Fritters I’d love to hear how you enjoyed them! Pop a comment and a star rating below! You can also FOLLOW ME on FACEBOOK, INSTAGRAM and PINTEREST to keep up to date with more delicious recipes. Mix all the fritter ingredients in a large mixing bowl until well combined. Heat oil in frying pan on medium heat. Place a tablespoon or so of the fritter mixture in the pan and flatten with the back of the spatula. Repeat with the remaining mixture, cooking in batches without overcrowding the pan. Cook for 3-4 minutes each side until golden and crispy. Transfer to a plate lined with paper towel. EXCESS MOISTURE: I grate the zucchini and carrot directly into a colander and leave rest for 10 minutes. Then I squeeze out extra moisture in batches with my hands and place into a clean bowl. OR You can also wrap the grated zucchini and carrot into a clean tea towel or cheesecloth and wring out. This is an important step to avoid soggy fritters! MIXTURE NOT HOLDING: If the mixture is too wet and not holding together, add a tsp of flour more at a time until desired consistency is reached. OIL: I use olive oil, however, feel free to substitute for another frying oil if you prefer. You want just enough oil to cover the bottom of your fry pan. HEAT THE OIL FIRST: Make sure the oil is heated before adding fritters to the pan. This stops the fritters from absorbing all the oil. COOK IN BATCHES: I made two batches, 4 fritters at a time, to avoid overcrowding. STORING: Store in an airtight container in the fridge for a few days OR individually wrap cooled fritters with cling wrap / plastic film and pop in an airtight container or freezer bag in the freezer for 1 month. REHEATING: Preheat oven to 180C / 350F. Place fritters on a baking tray and pop in oven for 10 minutes, or until heated through. UPDATES: First Published August 23, 2018. Last Updated March 11, 2019. 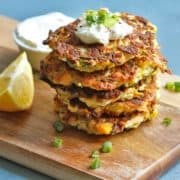 No changes to the recipe, just updated with more tips and tricks on how to make perfect fritters every time. NUTRITION: Nutrition information is a rough estimate based on one fritter. I suppose the cheese is grated? Good pick up Cynthia 🙂 I’ve updated the recipe now but yes it is grated!